Topics range from fossil remnants on Axel Heiberg Island to collaborative tourism planning in the Yukon; from the influence of sea-ice and ocean circulation on arctic climate, to the differences between Inuit healing and western medicine. Yet, there is a common thread that links all of these papers. It is a place. It is the North. The importance of such a perspective is often lost in an academic world that rewards specialization by emphasizing expertise in a narrow field. But the boundaries between disciplines are becoming more and more artificial in an increasingly complex and interconnected world. An interdisciplinary approach built on 'place' provided a platform from which researchers could transcend these boundaries. 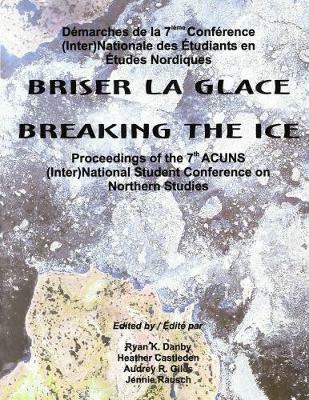 The ACUNS conference, and by extension, these proceedings, helps 'break the ice'. Includes papers by Marni Amirault, Donna L. Atkinson, Johanna Berge, Nilgun Cetin, Paul G. Myers, Suzanne de la Barre, Vasiliki Douglas, Audrey R. Giles, Sarah Giles, Brenda Guernsey, Joanna Kafarowski, Gita J. Laidler, Francis Levesque, Patrick T. Maher, Andrew C. L. Postnikoff, James F. Basinger, J. M. Ross, Michelle Schlag, Anne-Pascale Targe, Mariana Trindade, David Greene, Mike Gravel. Extended abstracts by Anna Dabros, Marcia J. Waterway, Colleen M. Davison, Ekaterina Evseeva, Patrick Faubert, Harri Vasander, Line Rochefort, Eeva-Stiina Tuittila, Jukka Laine, Ulrik Pram Gad, D.C. Hardie, J.A. Hutchings, Ioana Radu, Frank J. Sowa, Reid A. Van Brabant and Antoni G. Lewkowicz.